We took a glimpse at what's new and cool at the Play Store in the interface draping department for the month that passed, and noticed a few launchers and interface tools that you might find useful, or at least funky to try out. First in line are the Android Lollipop and iOS 8-style launchers, of course, as the newest editions of Google's and Apple's mobile operating systems are the hot topics in the software departments at the moment. There are also a few novel takes on improving on your stock device interface, like adding custom toggles in the notification bar, as well as an influx of small, lightweight launchers with tiny footprint that won't be as much of a drain on your phone's resources as the big boys, making them suitable for lower-end devices, so check them out if you got one of those. The new L Launcher is one of the best imitations of Android 5.0 Lollipop we've seen so far, bringing Google's newest version to your Android 4.0+ gear. It has all the basic launcher paraphernalia, plus numerous themes to choose from, a sidebar that can be dragged out from anywhere, and a swipe right gesture to evoke Google Now. The fresh Hola Launcher prides itself in being the one with the smallest resource footprint, suitable for low-end devices, and yet having all the prerequisites of a good launcher piece. Hola Launcher has only 1MB installation package, and memory usage that is half that of popular 3rd party or system launchers, and is also 20% zippier than other lightweight launchers, according to the developers. It is chick full og gestures, too - Hola Swipe from the corner shows your recently used and newly installed apps, Hola Boost speeds up your phone with a tap, and Hola Box slides up with two fingers to activate the hidden files function. There are plenty of high quality themes, wallpapers and fonts, too. 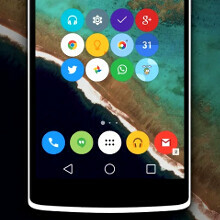 Want some Lollipop with big, fat, senior-style icons and push buttons? Then the just issued KK Big Launcher is for you - it is styled after Android 5.0's Material Design language, but everything is enlarged - the icons, the labels, the apps in the drawer. KK's Big Launcher also includes a nifty sidebar with a switcher, recent app menu, cleaner, and so on. Nokia's newly-minted Z Launcher for Android is an interesting take on starting and running apps, letting you just scribble the first letter of the app or other stuff you are looking for on your phone's screen, and popping up results. 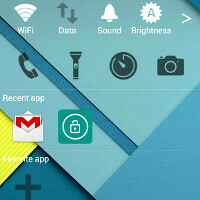 This one is a link to install the Z Launcher, as it wasn't accessible on all phones and in all regions at launch. Laze enters the Android launchers fray with one of the smallest resource footprints - in storage, installation package, as well as battery life drain. The developers claim that Laze delivers all that, while "making the using experience as seamless and smooth as iOS," and we tend to agree. Weatherwall does exactly what it says on the tin, adding pretty and realistic weather effects to your current wallpaper. The weather automatically updates as it changes outside and is easy to integrate with your wallpaper, whether it is your phone or tablet. The weather effects are split into sunny, cloudy, light rain, fog, dust, dark, star, sunset, and ice. The Transparency Launcher keeps your viewfinder as a live wallpaper in the background, so you can still launch apps, fire a flashlight, or operate the interface, without skipping a beat of what's happening beyond your phone's screen, and into the streets - saves you from running into bears while texting, for instance. Your phone maker didn't provide enough app shortcuts and other toggles in its own Android overlay (looking at you, Sony)? The MoNoLauncher is here to help - by installing it, you can place a mirror, flashlight, app shortcuts and other functions in the pull-down notification bar for quick access from everywhere. Have PSY chilling and dancing in your homescreen background at all times with this Gangnam Style live wallpaper, no matter how distracting it might be. Another launcher that promises small footprint and uninterrupted experience, the i Launcher differs itself by embodying the best of both worlds - say, the iOS 8 automatic folder categorization, and the Android power with numerous themes, wallpapers and icon packs, as well as a handy side bar to launch apps, use tools, search, and the like. Needs more Lightning Launcher Xtreme. I've got it too, but it's in dire need of a visual overhaul. I don't know if it has been done yet, but you guys need to do a custom rom comparison between some of the major names. It might be a bit pointless since not all roms are available for all devices, but the majors should make it just enough for the article. Where can I find that Weatherwall app? I tried to follow the link but it shows that it doesn't exist..